Thank you for your interest in Archadeck of the Piedmont Triad. We are the second oldest Archadeck location in our international franchise company. We’ve been building here in the Piedmont Triad for 21 years as of 2012. Businesses will come and go for many different reasons but we’re still building after many huge fluctuations in the economy and many changes to the outdoor market. Back in 1991, we mostly built decks. Today we build all kinds of porches including screened porches, open porches and multi-season porches, and front porches. We build pergolas, trellises and other shade structures. We build patios and hardscapes and all sorts of outdoor living areas including outdoor kitchens and outdoor rooms. Even decks have changed. Over 20 years ago, decks were built mostly out of natural wood whether it be pine, cedar or another natural wood. Today many of our customers are looking for synthetic woods. Many companies now create decking and outdoor building materials that either are a combination of wood fiber and resin or some that are made completely out of PVC. The look of these new boards is stunning. They have wood grain patterns, wood streaking and a whole number of different techniques to enjoy the beautiful look of real wood but the performance of something that still looks great 15 or 20 or 25 years down the line. In addition to natural wood and composites, we now also build decks with hard woods such as Ipe. Pronounced “ee-pay”, Ipe is a Brazilian hardwood that is so dense it needs to be pre-drilled before assembling into a deck or other outdoor structure. This is the wood that’s used on the New Jersey Boardwalk and in major theme parks because it not only can take the beating of water and an immense amount of foot traffic but it also has beautiful coloring and can last up to 50 years. Today’s homeowners are investing in their outdoor living spaces so they can enjoy more of their property and enjoy the outdoors while staying at home. Our customers are building high-quality spaces that will last a long time. Our homes are built to last for the foreseeable future and our outdoor spaces should be built the same way. At Archadeck of the Piedmont Triad, we pride ourselves in building these structures that withstand the test of time and lots of fun family use. We’ve built project that were $2,000 and projects that were $50,000 from everything in between smaller homes to mansions.Since 1991 we’ve built over 2,000 projects in the Triad area. If you are considering an outdoor project at your home, give us a call for a free consultation. (336) 664 – 1332 or email piedmonttriad@archadeck.net. 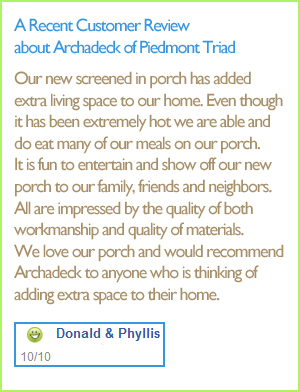 Visit our Archadeck of Piedmont Triad website for loads of photos.